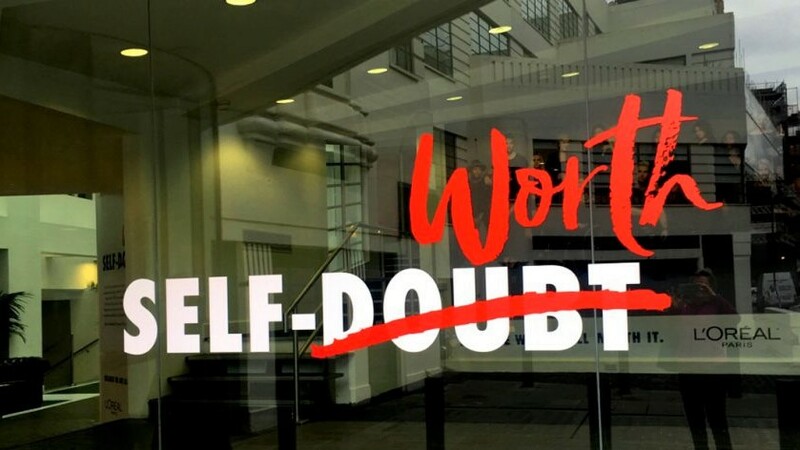 Is Self-worth Better Than Self-doubt? I was on my way to a meeting when I stopped to take this picture. It was the office of an advertising agency (this is the slogan for a L'Oreal campaign the agency's currently running) and it brought to mind something that one of my mentors had posted about just the previous week. The L'Oreal campaign is urging us (well, mainly the women amongst us!) to replace any feelings of self-doubt with feelings of self-worth. Oh, and of course, it goes without saying that we can enhance that feeling of self-worth if we buy their particular products! Neither self-worth nor self-doubt, is any better—or worse—than the other. They are both illusory states of mind, transitory feelings that we create in the moment. And both will pass. Both of those phrases contain the word 'self' and any discussion of 'self' brings us back to what we make up in the moment, a thought that comes to us unbidden, or a meaning we create from something outside of ourselves. To imagine there’s a ‘self’ that we need to manage or for which we need to create the perfect a state of mind is a falsehood and fairy stories. No-one, and nothing, can make us any less 'worthy' or less perfect than we already are, and nothing can give, or take away, access to our innate well-being. We already have everything we need in life. We don't need 'fixing', and that fix definitely won't come from changing our thoughts, or even changing our hair care products! What we feel in any moment will change; our state of mind goes up and down, there is an ebb and a flow to the way we feel -- which is the natural way of things. What's underneath that, what makes us capable of love, connection, creativity, and service, however, is always there. What makes us human, is constant, and we can tap into it whenever we want to, whatever our state of mind. Our shared humanity makes us special. And that's far, far more powerful than any manufactured notion of 'self-worth'. Whatever your mood in this moment, can you feel that to be true? That there is something deeper? That you possess a beauty and a strength regardless of how you feel? Knowing you always have access to that, and you can always act from that place makes it possible to rise above any feeling of self-doubt, self-worth or self-anything. Once you see the value of separating your feelings from what is real and true about being human, it makes it soooo much easier to take bigger and bolder actions. To remove your 'self' from your decision-making is the most powerful place you can come from. It's what makes you unstoppable. And, surprise surprise, when you focus on coming from that place, self-doubt will likely dissipate as a welcome (but not intentional) by-product!